I'm running out of superlatives for these guys. What can you say about a band that gets better month by month - particularly when they were something special to begin with!? Band originals smattered with a couple of contemporary standards. One of this latter category, a Wayne Shorter tune, was dedicated to my humble self. I didn't catch the title but someone suggested that it may have been a reference to the ill-founded rumour of my advancing years. Rubbish! I'll take anyone on at conkers, which just happened to be the name of one of Master Turner's compositions (it may have been Conkers, Conquers or even the Geordie version - Konkas. Whatever, it was a number that kicked up the dust. A band of many dimensions: Turner looking to reach another galaxy, Burns, by nature, closer to other galaxies, coming down to Earth and burning the sand. Edis, the visionary, a man with a coat of many colours but never a straight jacket. Susans, the rock. Leo Fender surely had Paul in mind even though Paul wasn't born! Then there's Rob Walker - not just a drummer but a composer too! His Autumn Afternoon had me hooked just by the title, although, it has to be said, it began totally boring and ended up totally compelling - best number of the night by a whisker! Richard Burns' take on The Bill was a car chase, a car crash, an investigation into how to make jazz grab the unusual suspects - subtitle it Sun Hill Boogie. There was more, so much more, but, just imagine going into Birdland or the Blue Note back in the good old days, maybe you'd find the music at Hoochie on the second Thursday of each month on a par. Not only that, no cover, no minimum and cocktails are 2 for 1. Plus, think of what you're saving on the air fare! 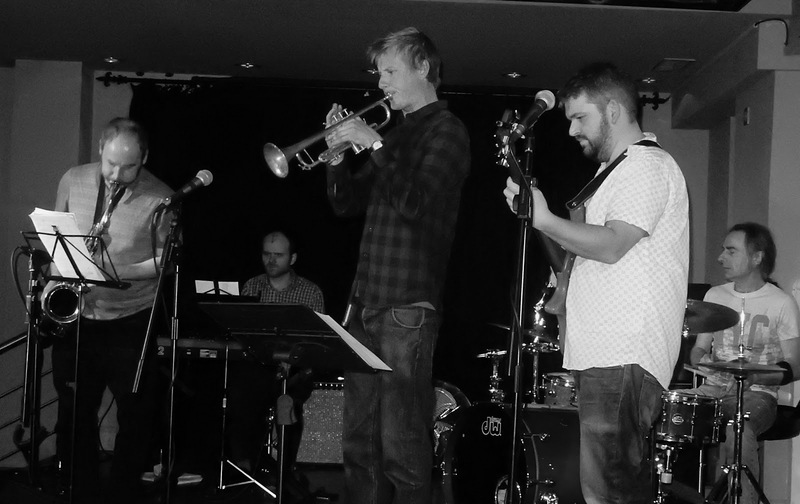 If the rightly acclaimed youth band Jambone can get a slot at this year's EFG London Jazz Festival then the Pilgrim St. Set are worthy of a gig next year.